The Magic Flute, KV 620 (A german opera in 2 acts). Composed by Wolfgang Amadeus Mozart (1756-1791). Edited by Gernot Gruber; Alfred Orel. For 9 soprano voice solos, 4 tenor voice solos, 5 bass voice solos, 4 speakers, mixed choir, orchestra. This edition: Paperback, Urtext edition. Paperback. Barenreiter Study scores. Study score. Language: German. KV 620. 370 pages. 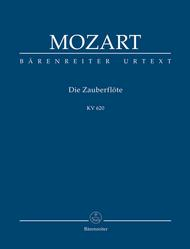 Published by Baerenreiter Verlag (BA.TP155).ISBN 9790006201334. With Language: German. 22.5 x 16.5 cm inches.